Protein expression is defined as the process for the development of amino acids or proteins within the cells of living organisms. Protein expression includes three process, namely, translation, transcription and post-translational modification. Globally, development in the arena of proteomics and biotechnology industry, rising incidences of chronic and autoimmune diseases, rise in the awareness among people regarding protein expression, increasing focus on research and development process, growing usage of protein expression technologies in industrial protein manufacturing organizations, and rise in adoption of protein-based drugs over non-protein-based drugs are the prime growth drivers of protein expression market. 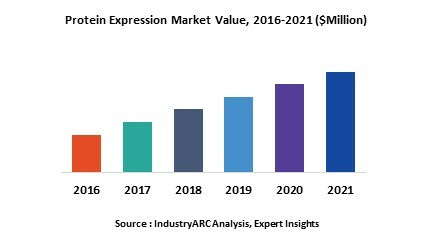 In addition, increase in adoption of protein expression in emerging economies such as China, India and others, will create new opportunities for protein expression market. However, higher cost of the research and development, and complex government approval processes are the key restraints for protein expression market. Geographically North America dominated protein expression market, because of higher adoption rate for biotechnology based therapeutics, high medical reimbursement facilities, and technological advancement. Asia Pacific is projected to have fastest growth, owing to rapidly increasing aging population, rise in consumer awareness, favourable government policies, modernization of healthcare infrastructure, developing pharmaceutical and biotechnology, and growing population chronic and autoimmune diseases patient in developing nations such as China, and India in this region. Among all the end-user, pharmaceutical and biotechnology companies has the highest market share in protein expression market. Therapeutic proteins are the market leader in protein expression market among all types of applications. This report identifies the global protein expression market size in for the year 2014-2016, and forecast of the same for year 2021. It also highlights the market drivers, restraints, growth indicators, challenges, and other key aspects with respect to global protein expression market. 15.3. Thermo Fisher Scientific Inc.
15.4. New England Biolabs, Inc.
15.8. New England Biolabs, Inc.